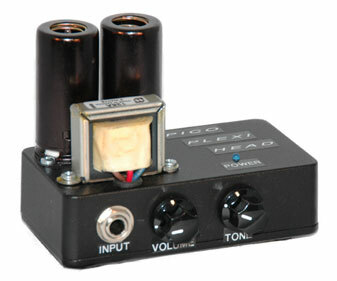 The Pico Plexi Head is a miniature tube amp. It uses a 12AX7 in the preamp and a 12AT7. The 12AT7 uses its triodes in push-pull in the power amp section. This little amp is built completely point-to-point for its signal circuitry. A modern switching DC-converter turns the 12V DC voltage that the Pico Plexi Head gets fet through the supplied DC wall-wart (which operates throughout the whole world!) into a whopping 280V for the plates under load at the power amp section! Like the name of this amp already implies, its tonal magic stands solid in the amp tones that are reminicent of the plexi marhall-erea. The Volume and Tone controls are interactive with each other and take you from a slightly crunchy guitartone right down to the classic marshall sound from the sixties with all its dynamics, warm and smooth tone. Because the amp puts out about 0,5 W. of output power, these beautiful tones are available at soundlevels that are almost everywhere acceptable. It even comes with a built-in speaker! Great if you’re into lofi sounds eg. for slide playing or intro-parts on your recordings. The output section can get wired for either 4, 8 or 16 ohms. Simply specify the cab you’re planning on using with this amp and I’ll wire the Pico Plexi Head up accordingly! The Amp Pedal is a very good example of a product that’s been developed through frequent requests by customers that already got the Pico Plexi Head. They already really, really liked the tone the Pico Plexi Head produces but wished to be able to use that tone in bigger amp setups. Pretty much like a pedal to be switched in and out of the signal chain. This is what the Amp Pedal does essentially. With the Amp Pedal, you can hook up the Pico Plexi Head (but also amps like the Zvex Nano Head for instance) into it via the upper two jacks and have the input and output fed by the guitar into the amp respectively. A special speakercable is supplied with the unit in order to be able to have the speaker output from the Pico Plexi Head connected with the Amp Pedal. 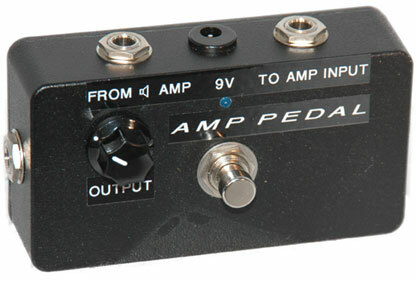 The connection from the Amp Pedal to the input of the Pico Plexi Head is buffered through a special buffer circuit in order to make it possible to use any length of cable between the Pico Plexi Head and the Amp Pedal. This way, it’s possible to have the Pico Plexi Head set up safely as part of the backline during gigs while having the Amp Pedal making part of your pedalboard up front on the stage! The Amp Pedal also gets a lot of use in home-recording situations. The output from the Amp Pedal gets connected through the soundcard on the computer and having it set up this way, you’re able to record with the Pico Plexi Head in complete silence! The Amp Pedal doesn’t have a speaker simulated output (yet...) so you’d have to use a seperate speaker simulator (either a circuit between the Amp Pedal and the input on your soundcard (eg. the hughes and kettner redbox pro or palmer pdi-series) or via the recording software in your computer) in this situation. Essentially, the Pico Plexi Pedal is the Pico Plexi Head and Amp Pedal in one enclosure. If you’re planning on using the Pico Plexi sound for live-use only, this pedal is the most simple setup! Just plug your guitar into it’s input, connect the output to your main amp and you’re ready to rock! It’s still possible to use the Pico Plexi Pedal as an amp on it’s own too though. There’s a little 3,5 mm. jack output on the left side of the pedal that operates as a speaker-output. Just hook up your favourite speaker cab with this output (using the supplied speaker cable) and you can use the pedal as an amp! The output-control gets disconnected in this application. Allthough 0,5 watts of tube output seems like not much of a deal for an amp, for some users this still is too loud. This also greatly depends on the efficiency of the speaker used. 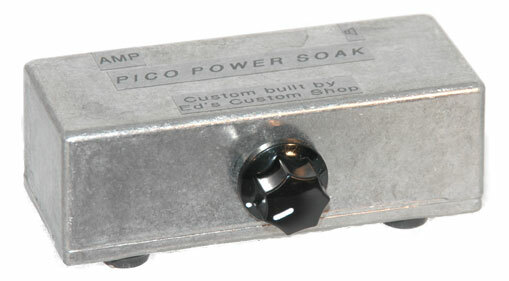 So Ed’s Custom Shop has developed the Pico Power Soak! Like its name implies, this is a power soak. You can vary the output of the power stage of the Pico Plexi Head (or other low- output amps like the Zvex Nano Head) to the speaker. This way, you can still crank the amp up to the desired level while not having to deal with any sound pressure at all. This was the first pedal I developed. My goal with this design was to be able to have a pedal with a tube incorporated and still be able to have it run on a single 9V battery. I just love tubes. Their response and abilities in terms of dynamics are still unsurpassed by any other design and this clearly shows in the Micro Tube OD. This pedals produces a great warm tube tone with loads of dynamics. You can easily control the level of overdrive by varying your pick attack and/or volume level on your guitar. The Micro Tube OD responds to all your playing nuances while keeping its tone transparent and true. This pedal uses the DL 65/66/67 series of tubes which are designed originally for hearing aids back in the early sixties! It gets a great new life on its own again with the Micro Tube OD! 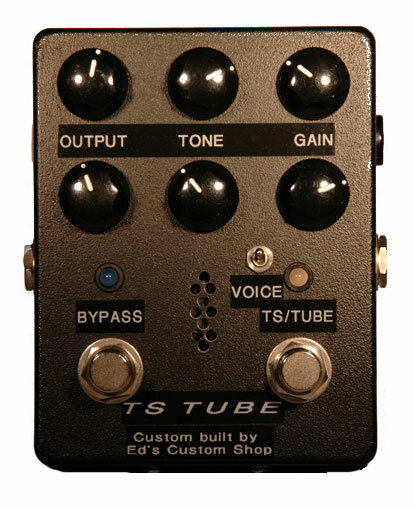 The TS Tube is a very allround pedal. Its design started as a joke to be honest. I always wondered why a tubescreamer-based pedal was called a tubescreamer because a: it doesn’t contain a tube and b: it doesn’t scream at all! So I incorporated a tube circuit into a TS 9 Tubescreamer. This sounded great an I have modded a couple of TS 9’s this way but eventually, making a seperate pedal based on these modified TS 9 circuit seemed like a more practical way. It also made it possible to expand the options of the design. The TS Tube pedal has two sections: a TS-section and a Tube-section. Each section has its very own character. The TS-section finds its home-base in the famous tubescreamer-anatomy of course. Instead of a brutal copy of this circuit, I went a step further and improved this circuit; I changed its tone in order to have more bass available, a much more wider gain-range (both more and less) and different clipping characteristics via the voice switch. From the classic mellow clipping to a more agressive one or just more clean, like a preamp does. The voice-switch makes it possible. Then there’s the Tube-Section. This section produces great tube tones that go from crunchy to heavy saturated all with a very smooth response. Sometimes you just want more of what you already got and like in your guitar tone or you want to make sure your tone will remain clean and clear throughout the whole signal path. The Tube Booster is a great tool in order to have this done in a beautiful, warm and dynamic way. This pedal also runs on a tube (a 12AX7) with high voltage on the plates. You can alter the output and the tone with their respective controls and there’s a color-switch for even more tonal options. The Spiritual OD is inspired by the great guitar tones players like Robben Ford and Larry Carlton get out of their Dumble amplifiers. Smooth overdrive tones! The voice-control alters the gain- and tonal ranges available to the overdrive circuit while the more usual gain-, tone- and volume controls determine the amount of gain, highs and volume the pedal produces. The best way to set up this pedal with your other equipment is by starting to adjust the voice-control. After that, you can set the gain, tone and volume controls accordingly. Like all pedals built by Ed’s Custom Shop, the Spiritual OD has true bypass switching, led-indication and an input for dc.